A forms processing system from Kendata Peripherals has enabled researchers at the London School of Hygiene & Tropical Medicine to obtain results from a cancer study much more quickly than would otherwise have been the case. 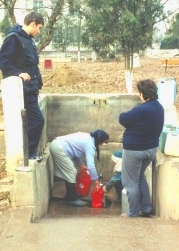 Co-ordinated by LSHTM's Public & Environmental Health Research Unit, the multinational ASHRAM Project was designed to assess the cancer risks associated with cumulative exposure to elevated concentrations of arsenic in drinking water drawn from communal wells in parts of Hungary, Romania and Slovakia. Interviewers across the three countries completed two 20-page questionnaires for each of the 1800 subjects, and the resultant information then had to be entered into an Access database for analysis. According to Giovanni Leonardi, honorary research fellow and consultant epidemiologist at LSHTM, the amount of work involved in entering such a large amount of data manually would have been excessively time-consuming and laborious: "From previous environmental-health projects, I knew that, if we had done it all by hand, it would have been necessary to use double data entry techniques to produce a database of sufficient integrity, and this could easily have involved dozens of people working on relatively boring tasks for 6 months or more." Wanting to avoid this scenario, Leonardi suggested to his colleagues that a forms processing system would provide an effective means of entering the data automatically. They agreed, and so Leonardi contacted Kendata to order an AutoData Scannable Office system, which was the natural choice for him as he had already seen it used successfully for surveys on a wide range of health-related topics in both the NHS and the Health Protection Agency. Comprising a high-speed scanner, forms processing software, Microsoft Word templates and special TrueType fonts, AutoData Scannabl0e Office enables data to be scanned from paper forms directly into a spreadsheet or database without the need for cumbersome data-exporting procedures. Form designs can include fields for check-mark boxes, bar codes, printed type and hand-printed characters. According to LSHTM research fellow, Rupert Hough, designing the ASHRAM forms was straightforward. "Since AutoData enables customised forms to be designed in the familiar environment of Word, the learning curve is greatly reduced," he said. The forms were translated into the local languages and, for simplicity, used mainly check-mark boxes and hand-print recognition fields. At the beginning of the project, all the interviewers from the three countries gathered in Romania for a training conference, where Kendata staff provided detailed guidance on filling in the forms and scanning them using the AutoData system. Giovanni Leonardi was particularly impressed with the level of after-sales support provided by Kendata: "That is always an important consideration, because otherwise you can spend a lot of money on a system and end up never using it," he said. The initial training in Romania, together with detailed error-checking procedures during the scanning process, helped to ensure that the quality of the data was at least as high as could have been achieved manually using double data entry. Leonardi says the key benefit of the AutoData system has been time saving: "As well as vastly reducing the labour requirements for the data-entry process, AutoData helped us to minimise the delay between completing the data collection and obtaining clean data ready for analysis."